Using the a simple autoregressive model I calculate that 4th quarter GDP was only 14,900 billion dollars. The model also forecasts that GDP growth in the first quarter of 2011 will be at a sluggish 1.1% compared to the 30 year quarterly average of 1.47%. At the time of this post the government is still compiling the 4th quarter GDP so the information is not public and the 1st quarter of 2011 has only barely begun. I use seasonally adjusted quarterly GDP data starting from 1947 from the St. Louis Federal Reserve Bank’s FRED database. Then set by using the Box-Jenkins methodology to fit an ARIMA model to this time series that will be the basis for the GDP forecast in this post. The ARIMA model consist of three parts: 1) The autoregressive part consist of a linear regression that establishes how past values of GDP are related to future values, 2) The “Integrated” part refers to how many times we have to take a difference to get a stationary series (see post on stationary series), and 3) the moving average part consist of how past forecast errors are related to future values of GDP. An ARIMA model will be developed using the Box-Jenkin’s methodology that will take into account past values and forecast errors to predict future GDP levels. I will use the Box-Jenkins methodology to fit an Autoregressive Integrated Moving Average (ARIMA) model to previous GDP data to support the forecast of future values of GDP. This methodology aids in identifying a forecast model, estimating its parameters, checking the model’s performance, and finally using it to forecast. All of these steps will be illustrated below as I develop a simple model to forecast GDP. The first part of the identification phase is to ensure that the model is stationary (see previous post on stationary time series) and if not then taking the first difference until it is. The plot of GDP on time above shows that gdp is not a stationary process so first differencing will be needed to ensure this assumption of the ARIMA model is satisfied. The number of times first differencing is used will determine the order of integration in the ARIMA model. The second difference of GDP turns out to be a stationary process. The Augmented Dickey Fuller test confirms that we can reject the null hypothesis that the second difference of GDP has a unit root (non-stationary) at the 1% significance level. The next step is to choose the ARMA model that best fits this data using a correlelogram. The first step is to set up a forecast error which will be the basis for the Moving Average term. A simple regression on the second difference of GDP to its lag value will serve as this error term. The table above shows the regression on the smaller model ARIMA (1,3,;2,1,3) this model has a Schwarz criterion of 10.42, while the expanded model of ARIMA(1,3,8,12,13;2,1,3,8,) has a Schwarz criterion of 10.46. I choose the simple model because it has the smallest Schwarz criterion value. The errors of the model appear to be a white noise process, mean 0 and constant variance. The Augmented Dickey Fuller test rejects the hypothesis that the model’s error term is non-stationary. The diagnostic check of the models performance validates unbiased estimates and the SIC criteria above used to select the simple model ensures maximum efficiency is estimation. In order to use the model that has been selected a mathematical formulation of the ARIMA (1,3,;3,1,3) must be outlines. After the model has been constructed using algebra the parameters estimated in this model above will be useful in building our forecasting model. Breaking down the lags and first differences yields the final forecasting model that will be used to forecast the GDP numbers. Using the Autoregressive model above I calculate the 4th quarter GDP was only 14,900 billion dollars resulting in a 1% increase that quarter. 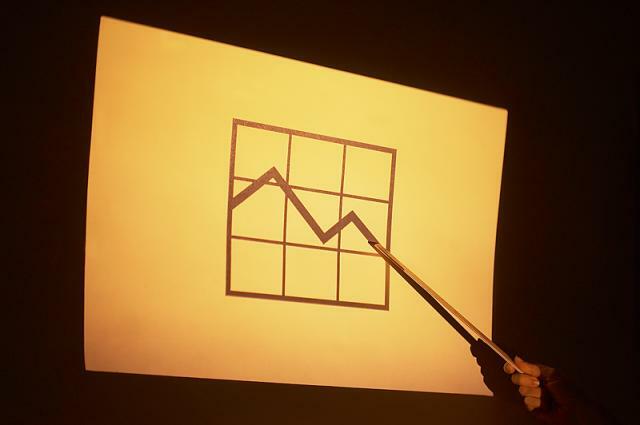 The model also predicts that GDP growth in the first quarter of 2011 will grow at 1.1%. Since 1980 the average quarterly growth rate for GDP has been 1.47%, so the forecasted growth will be sluggish in the next two quarters compared to historical averages.